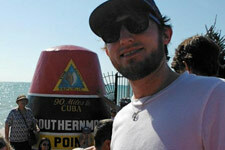 I’m going to start this post off with a clarification. The type of “heat map” I’m talking about isn’t the full-spectral-color-progression that comes to mind. These are also often used in the word of sports analytics (pitches thrown in the strike zone, field goal locations in basketball, etc.). 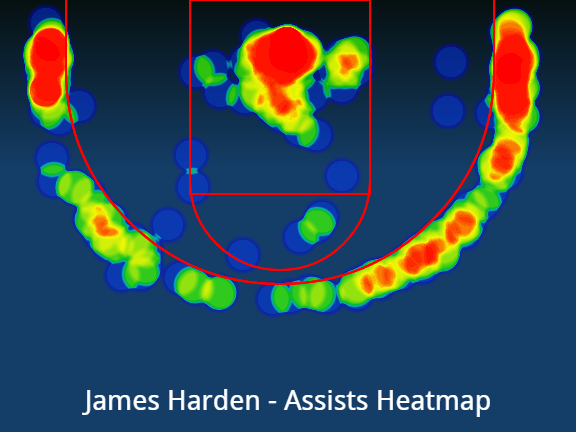 The “heat map” I’m talking about is a hue-intensity chart. The hue’s intensity corresponds to a percentage of the overall measure. Confused? Nah, you’ve seen this sort of thing before. The image below is actually similar to the graph I’m about to produce. These types of graphs make it easy to get a relative feel for the distribution of data in a set, based simply on the color intensity. I mentioned there would be a time domain involved. However, unlike the example above, my data aren’t binned into one hour time slots. They’re also not measured against a particular day of the week on the y-axis. 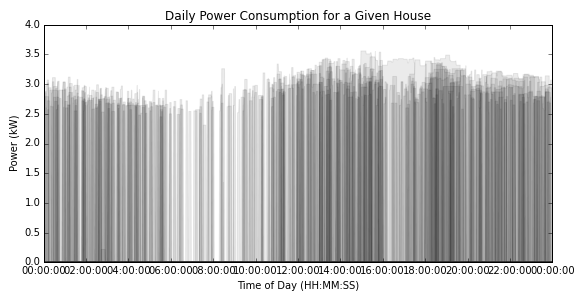 Rather, I’m dealing with homes’ power consumption data over the course of a month. 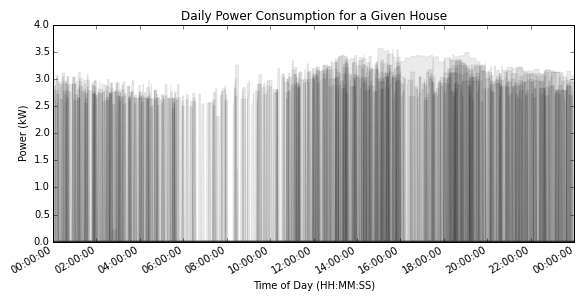 I’m trying to find out when during the day residents are using electricity the most often and how much power they’re consuming. The data are proprietary, so I can’t share them, but here’s a sanitized sample. This gives an idea of the pandas dataframe format and naming. Let’s assume I have this information for 30 straight days. So what I want to do is plot, what is essentially a histogram for each minute of every the day, at an opacity of 3.33% (1/30). 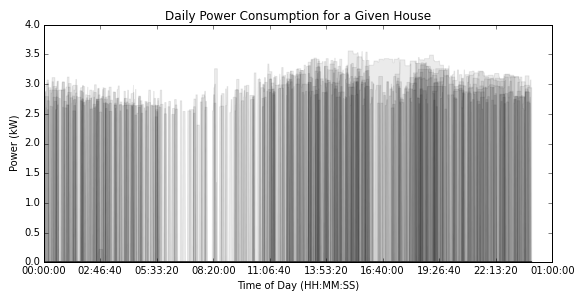 For instance, let’s say the that from 8:00-8:01 AM on the first day, a home’s power draw is 1.2 kW. For that particular minute of the day, a bar colored at 3.33% opaque will be plot up to 1.2 kW. If, during the second day, the home’s power draw is just 0.4 kW over the same time period, the resulting graph will be colored 6.66% up to 0.4 kW, 3.33% from 0.4 to 1.2 kW, and 0% above 1.2 kW. The opacities will continue to “stack” until all 30 days have been plotted. 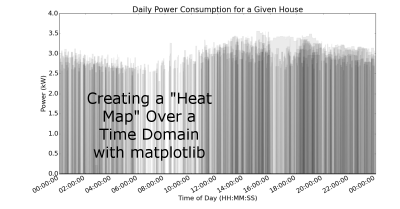 This could technically be done with the histogram plotting module built-in to matplotlib, but it’s not at all efficient. Instead, I want to use fill_between. Be wary of using fill rather than fill_between. It can result in some unexpected results, especially while using numpy arrays. The first thing I do is count how many days worth of data I have, and calculate each day’s opacity level. So far, this is what we’ve got. At this point you’ve probably realized why I made such a big deal about this heat map being over a time domain. The bounds aren’t set from midnight to midnight, and the major tick marks on the x-axis are all kinds of funky. 7200 seconds (2 hours). The reason we do it this way is that the numpy time variable are internally represented as seconds from midnight. That gets us to this point. The xaxis is completely illegible, so we let the plot know we’d like it to automatically clean up its mess based on the fact we’re dealing with dates (I know, they’re technically times, but times are a specialized date class) before tightening up the plot area and saving the plot! Pretty neat, huh? You can even see the extremely obvious drop in power consumption at 4:00 PM. That’s evidence of some of my work on demand response. “Hey,” you might say. “There’s no legend on that plot, it’s completely useless!” Good observation, reader. The reason for that is that it’s not technically a legend, and it’s actually a separate subplot. I’m going to cover how to create the legend in a later post!